This accolade is given to hotels that offer an exceptional standard of quality, service, and value, based on the Vacation Satisfaction Questionnaires completed by thousands of customers upon returning home from their Apple Vacation trip each year. 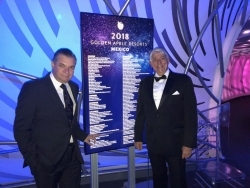 Cabo San Lucas, Mexico, September 14, 2018 --(PR.com)-- Casa Dorada Los Cabos, Resort & Spa received the 2018 Golden Apple for consecutive year this month. The Golden Apple Awards are bestowed on properties which offer an exceptional standard of quality, service and value, based on the Vacation Satisfaction Questionnaires completed by thousands of customers upon returning home from their Apple Vacation trip each year. Travel agents report that the Golden Apple Award designation builds consumer confidence and has a major influence on purchase decisions. Leonardo Perli, General Manager of the resort, expressed his gratitude for receiving this award on behalf of all who make up the Casa Dorada Los Cabos, Resort & Spa team and pointed out the importance of creating unforgettable memories with our guests by all companies in the tourism sector. About Apple Vacations: For more than 45 years, Apple Vacations, America's favorite vacation company, has provided affordable, top quality vacation packages from the US to vacation destinations throughout Mexico, the Caribbean, Central America, Hawaii and Cuba. With the support of travel agents, Apple Vacations has delivered more passengers to Mexico and the Dominican Republic than any other tour operator worldwide. Apple Vacations is consistently voted "The Best Tour Operator to Mexico and Latin America" by readers of the leading travel trade magazines.